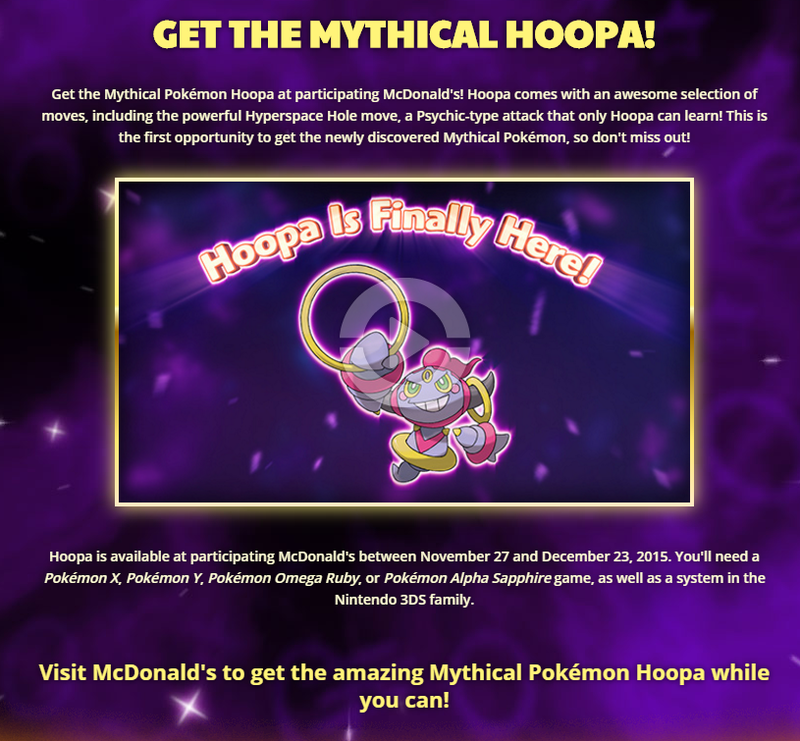 I've only gotten the newsletter about Hoopa today soooo, you all have like 4 days till its gone. To get it: Visit a participating McD's -> turn on your 3DS' wireless -> Mystery Gift -> Receive gift -> Yes -> Get via Internet -> Yes -> Talk to the delivery girl in the Pokemon Center to receive your Hoopa. Have fun! I'd imagine, its always either north american or japan. Don't forget you can get a complete 100% free sandwich (ZERO purchase required) with their mobile app. Just sign up, confirm email, and load the coupon at the store, and tell them what you want. Can be used repeatedly (not recommended same store/day)... just sign up again, restart phone/clear cache, repeat above. Free Hoopa, free food. Good times. lol my closest McDonalds doesn't work for Hoopa. My Pokemon obsessed co-worker says Thanks for this. Man, the last time i got a free sandwich from McD's was like 10 years ago where we got a bunch of coupons for buy 1 get 1 free and everyone who ate one had to rush to the bathroom and explode. One of us had to suffer and wait for a toilet to become available. Haha. This is the same co-worker that is convinced that Pikachu is just going to come walking through the lobby of our work once Pokemon Go becomes active. The greatest. Seriously though, I am so excited for Pokemon Go. Me too! We were reading more about it today. I'm just hoping the actual game lives up to all the hype it's getting! But they say that finding Pokemon will be fairly easy. Within 5 minutes of walking out of your house, according to the article. It was in North America anyways. Australia gets it from Jan 18th to the 29th. Well I completely missed this! Seems to happen every time there's a pokemon giveaway - I'm always several days late.